Today's host is one of my recent favourite blogger and whenever i go to her space, she speaks through her post and definitely with her beautiful clicks. Aparna Bhat of Flavors And Colors is my today's guest host, she is a Doctor by profession which i came to know the day she sent me her post with the questions i asked her to know more about this wonderful person behind Flavors And Colors, also while chatting with her i came to know that is a cousin of one of my blogger buddy who carries the same name too. Just go through her space, you will get to see a good collection of beautiful dishes you can dish out without any struggle. I have couple of favourites from her blog and trust me you will definitely enjoy going through her space. Let's hear from Aparna now..
Hello everyone! I am very excited to introduce myself and my toddler blog “Flavors and Colors” at Priya’s space. I have known Priya's blog for quite some time now, but it’s just 2 months back we interacted for the first time through chat messenger. When I browse her blog, I found that she is indeed a versatile cook. 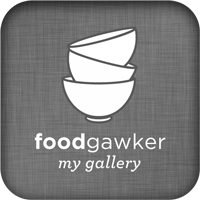 She has shared so many interesting recipes and has the longest baking list I have come across. I salute her for being so energetic, punctual and maintaining the momentum with her posts. A very kind person, I would like to thank Priya for giving me such an opportunity. I am Aparna Bhat, mom to two beautiful boys and doctor by profession. I am the author and photographer at Flavors and Colors, where I have been sharing my passion from Nov 2012. 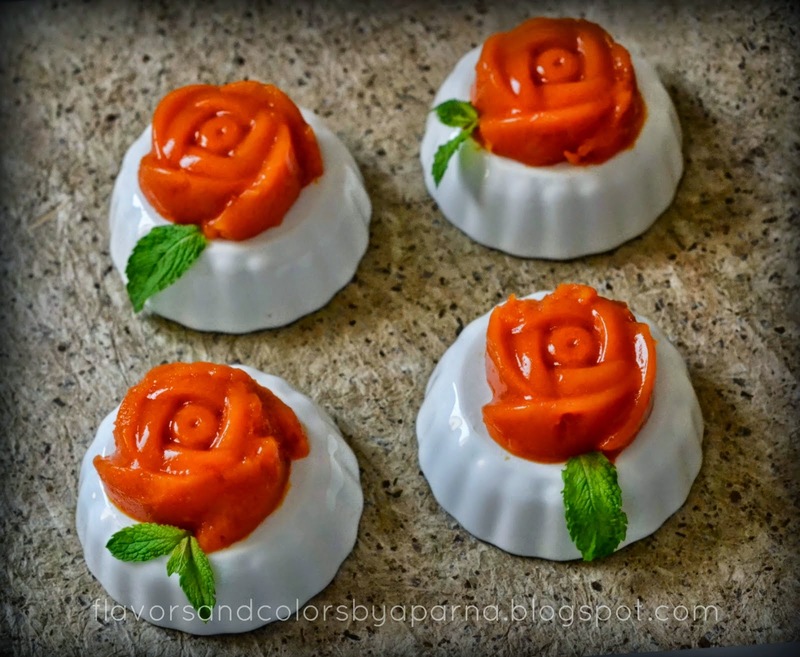 The blog is all about experiments from my kitchen [some my own creations and majority inspired/adapted from different sources] relished and appreciated by my family members and friends. 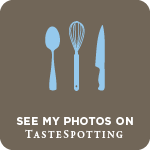 I try and provide a visual hint about the food through my clicks to my blog audience. Hopefully the clicks tempt them and tantalize their senses! Before it used to be cooking with less interest and no attention paid for e.g. to cooking time, use of ingredients in sequence or to get the right texture of the dish. Was poor in managing my recipe notes, they would get lost many times, and this lead to lack of confidence while cooking the dish again, even if I had prepared it before. Photography was merely restricted to capturing moments with my kids. With blogging came in the ease of storing recipes in order, an easy reference in case I forget the proportions of ingredients for a particular dish [I’m bad at remembering them]. Camera got focused on food and this sparked my interest towards perfect cooking. Since then it has been learning each day. It's like a stress buster that adds some excitement to my daily routine. I am more confident now while cooking as well as clicking. Blogging also connected me to many friends [bloggers/photographers] who share similar passion. In year 2007, my quest for healthy recipes opened the doors of food blogosphere which left me completely hypnotized with all those drool worthy pictures and I began to experiment in my kitchen recreating/adapting those recipes. I shared them on social networking sites. Appreciation from my relatives, friends and well wishers encouraged me and I was motivated to put more efforts be it a recipe or a click! While sharing the recipes on food groups, I thought why not try storing these recipes with a blog. It would help me refer back to these recipes as and when I need them. Also it would be like an e-gift to my kids ~ good food memories which they can cherish. The name was thought towards the end of 2011 but it was only towards the end of 2012 that I gathered my courage and took the initiative to start with it. Blogging has become so competitive. When it gets connected to business the competition is even more and I am not the person who will run behind it to be part of that movement. This space was started as a way to organize and record my activities carried to pursue my hobbies. I don’t compare myself with other bloggers because the efforts put here are to the best of my abilities and time. I don’t want to lose the happiness that I receive by blogging. With no competition involved, I look upto other blogs and keep myself motivated in terms of trying out new recipes and to learn about food styling as well as food photography. I have shared recipes most of which are simple, easy to cook and can be managed easily by a newcomer too. The recipes that you would find here are vegetarian mainly from Konkani/ Amchi cuisine, some from other cuisines and eggless baking. I try to cook as perfect as I can with sincere efforts; I give equal time and importance to capture the final food with a hope that it will motivate my readers to try the recipes. There are many people as of now who inspire me, but it is photography that ignited my interest for cooking and I always think about the dialogue by Chef SK “Pyar se Banaye, khud khaye aur dusro ko bhi khilaye". It works like magic on me when I am lazy to enter my kitchen. The coding and html issues for design and template of blog were the initial challenges I faced [still struggle with it when new issues come up]. I took help [and continue to do so] of google search for solutions. My hubby has also been supportive in guiding me technically if I am stuck at a point. All recipes are my favourite. Each recipe has been attempted after a bit of research and cooked with love. Photos as you see here, here and here, make them close to my heart allowing me to cherish the memories associated with those dishes. -There are many tutorials online, which you can read and experiment the exercises explained there in your free time. Initially I managed with household stuff. When I was sure of my affair with flavors and colors I began to invest in props. There’s no such budget assigned, every prop I see I feel like picking it up but then I control myself. I have no specific plan for my blog posts. All I look is to cook sincerely and perfect myself with every attempt before I share the recipe. I want to be regular and even if that means at least one post per week its fine with me. Music/Singing, Art and Craft, and again the list goes on !!! The recipe I am sharing today is incredibly easy to make from minimum ingredients and requires very little time. 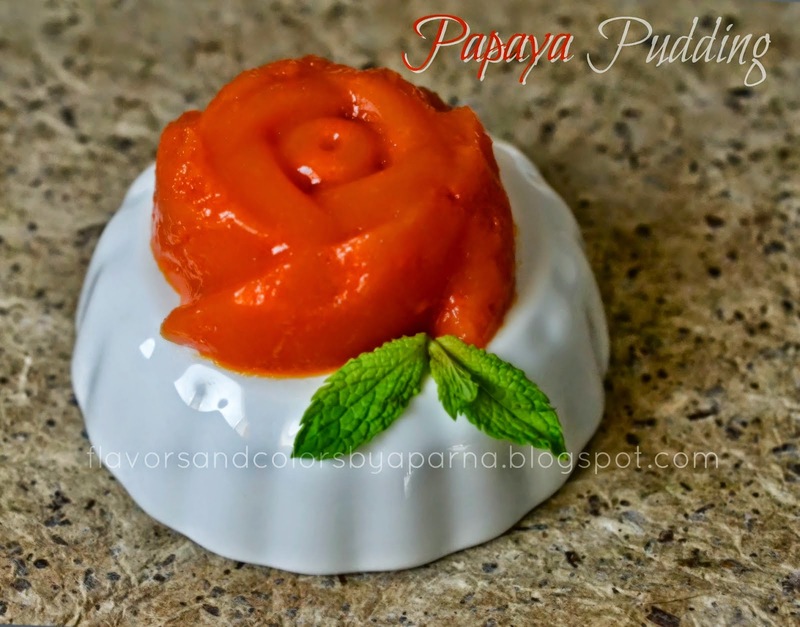 It’s Papaya Pudding. The recipe here by Tarla Dalal was bought to my notice by my friend “S” on food group. 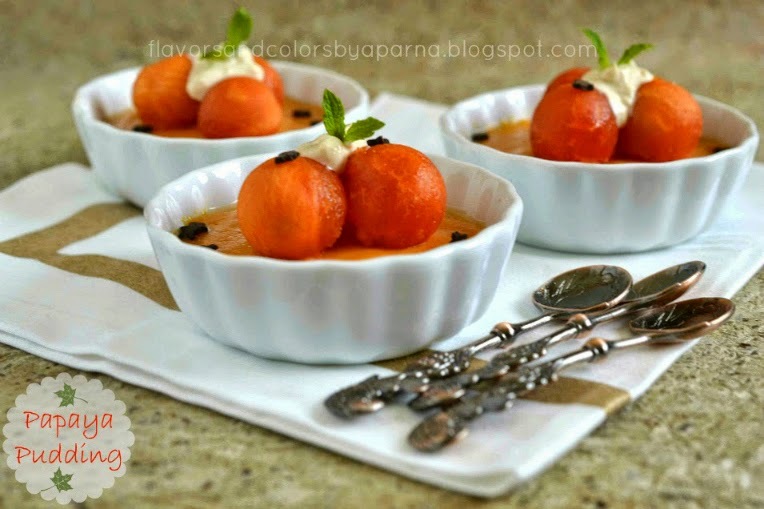 Papaya has large amounts of pectin which helps the pudding to set without any thickening agent such as agar agar or gelatin. It is rich in color and has plenty of nutrition. The dessert being very healthy, I have attempted it many times now and hence sharing it with you all for perfect guilt-free indulgence. Remove the skin of papaya, remove the seeds and chop into small chunks. Papaya should be ripe [reddish orange in colour] and please take care to remove the fiber part [lighter part] that is present below seeds, if not the dessert would taste bitter. It will surely satisfy your sweet tooth, so go ahead and try out this super simple desert recipe. Note: In the below pic, I have added ¼ cup cream and pinch of Kesar soaked in 1 tbsp warm milk to the above mentioned ingredients. The blended papaya mixture was directly poured into serving bowls, chilled and garnished with scooped portions of the fruit before serving. 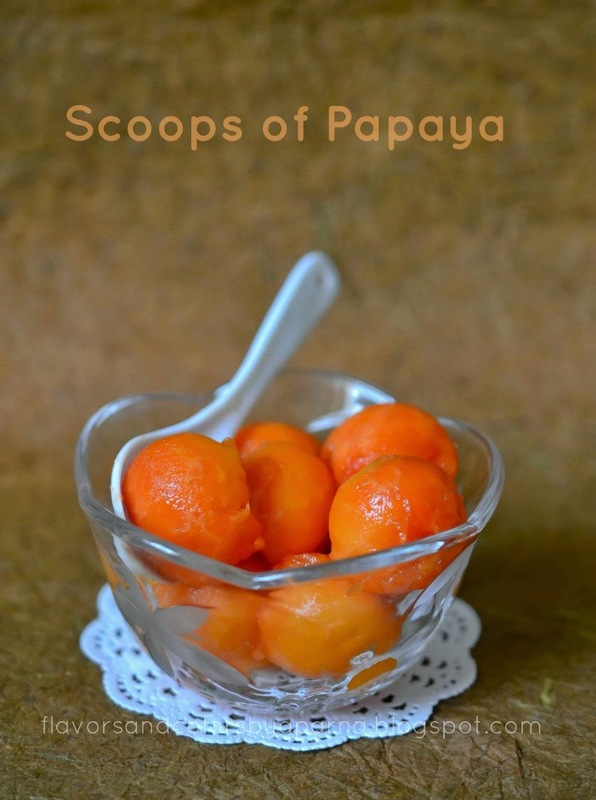 Hope you all enjoyed Aparna's Papaya Pudding, stay tuned for an another guest post by an another budding blogger. 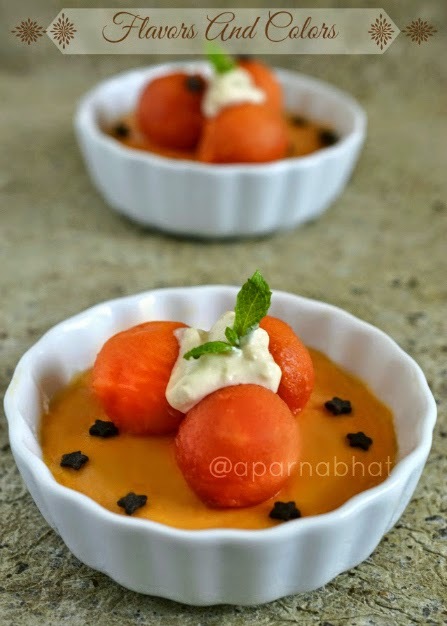 papaya pudding looks super and glad to know more about you Aparna. All because of this wonderful event. Keep rocking..
Nice to know abt her,stunning clicks,love the 1st photo,cute papaya flower,congrats to her!! Priya it was an honour for me to share my blogging journey on ur space ,,, Many thnks for this lovely opportunity !!!! Lovely dessert! Good to come across another new blog! Sound delicious, stunning pictures. Wonderful guestpost. So nice to know u Aparna. Loved this rendezvous. Thnks priya..
Nice post and great to know about you aparna! Thnks everyone for your kind words and appreciation ! Just loved the presentation and rose shape.. kudos! !